Att. Dr Zuzanna Łaganowska was recommended individually in the TMT (Technology, Media and Telecommunications) and Real estate law areas. Bakowski Law Firm was chosen to provide legal support for start-ups refunded by the Polish Agency for Enterprise Development (PARP) within the program “Legal support for start-ups”. By taking part in this program, the start-up can obtain our professional legal services refunded up to 20.000 PLN by PARP. The motions can be filed from now until 15 October 2018, but as the funds in the program are limited it is best to apply shortly. We are of course ready to meet and discuss our possible assistance and to help with the motion. The start-up to qualify must have a letter of interest or other document showing investors’ interest in starting or continuing the investment process. The business or company should not be carried out for longer than 5 years and obtain income from the commercial activity for not longer than 3 years before making the application. legal consultations supporting the start-up in its business activity. Bakowski Law Firm was again indicated as a one of the leading law firms in Poland in the prestigious Legal 500 ranking, with a particular recommendation of its commercial law, corporate law and mergers and acquisitions practice (commercial, corporate and M&A). We thank our clients for positive feedback and recommendations. The Legal 500 Series is widely acknowledged as the world’s largest legal referral guide highlighting the law firms who are providing the most cutting edge and innovative advice. 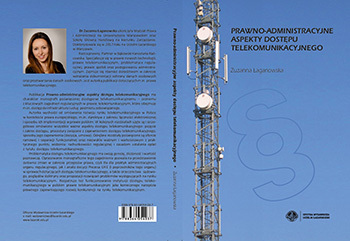 We are pleased to inform about the publication of a new book by the law firm’s partner attorney at law Dr Zuzanna Łaganowska “Legal and administrative aspects of telecommunications access”. 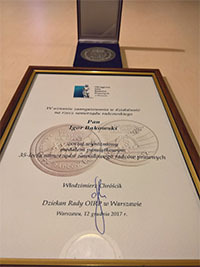 We are pleased to inform that Attn Igor Bąkowski, a long time judge at the Disciplinary Court at the Warsaw chamber of attorneys-at-law, was awarded by the Dean of the Warsaw chamber of attorneys-at-law with a medal for the 35 years of the attorneys-at-law association in recognition for his engagement and activity at the attorneys-at-law association. This year our law firm is celebrating its 10th year anniversary. 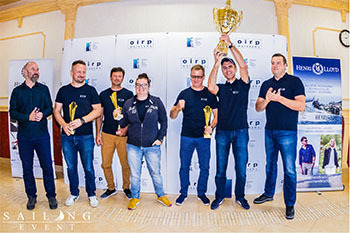 We are pleased to inform that Attn Igor Bąkowski with the crew, after a fierce sailing competition, won the XV Regatta for the Cup of the Dean of the Warsaw Association of Attorneys-at-Law. We are pleased to inform that Bakowski Law Firm was indicated for the third time as a one of the leading law firms in Poland in the prestigious Legal 500 ranking, with a particular recommendation of its real estate and construction practice. We thank our clients for positive feedback and recommendations. The Legal 500 Series is widely acknowledged as the world’s largest legal referral guide highlighting the law firms who are providing the most cutting edge and innovative advice. Bakowski Law Firm was indicated as a one of the leading law firms in Poland in the prestigious Legal 500 ranking, with a particular recommendation of its real estate and construction practice. We thank our clients for positive feedback and recommendations. The Legal 500 Series is widely acknowledged as the world’s largest legal referral guide highlighting the law firms who are providing the most cutting edge and innovative advice. Bakowski Law Firm was indicated as a one of the leading law firms in Poland in the prestigious Legal 500 ranking, with a particular recommendation of its commercial law, corporate law and mergers and acquisitions practice (commercial, corporate and M&A). We thank our clients for positive feedback and recommendations. The Legal 500 Series is widely acknowledged as the world’s largest legal referral guide highlighting the law firms who are providing the most cutting edge and innovative advice. On 23th of October 2015 Maciej Ligier – attorney at law was an expert during XIII Forum Energia w Gminie – GDAŃSK. Conference is a unique meeting of designers, systems contractors, investors and photovoltaic systems distributors. The conference topics related to technological, economic and legal issues. Our law firm was one of the partners of the event. We are pleased to inform that Bakowski Law Firm was indicated as a one of the leading law firms in Poland in the prestigious Legal 500 ranking, with a particular recommendation of its real estate and construction practice. The Legal 500 Series is widely acknowledged as the world’s largest legal referral guide highlighting the law firms who are providing the most cutting edge and innovative advice. The Legal 500 is an independent guide, and firms and individuals are recommended purely on merit, based on feedback from clients worldwide, submissions from law firms, interviews with leading private practice lawyers, and a team of researchers who have unrivalled experience in the legal market. The Legal 500 Series' analysis of law firm capabilities extends to 107 jurisdictions worldwide. Favorable tax status of old partnership limited by shares with limitations. Not every joint stock company- with the financial year ending after December 31, 2013 can use existing tax privileges. This determines the status of its shareholders- announced finance minister. which took place on 2 June in Warsaw. Attorneys at law: Igor Bąkowski and Maciej Ligier led thematic block entirely devoted to recovery issues in housing communities and cooperatives. We are pleased to announce that two laywers from our firm: mr Maciej Ligier and mr Michał Pacyga successfully accomplished counsel legal training and soon they entry to the list of attorney at law corporation. Congratulations! The Court held that the refusal to grant a perpetual right to use the land may be made on the basis of criteria other than those mentioned in the Bierut Decree from 1945. The premise can be legally effective disposals of real estate to a third party. The case was initiated in 2011, at the request of the printer and Bookseller. Św. Wojciech the oldest Catholic publishing house in Poland, after more than 60 years after the deposit it in 1948. The President of Warsaw and voivode of Masovia refused to establish rights of usufruct of land at Krakowskie Przedmieście, which formerly housed the bookstore and offices of the company. Provincial Administrative Court in Warsaw dismissed her complaint. The facts did not raise any doubts. Proposal for a decree at the time. The use of the land by the current owner cannot be reconciled with its intended purpose according to the plan Only those two conditions set. 7.2 Decree. In 1994, the Governor stated, however, enfranchisement on this real estate Commercial and technical Precision Industry Headquarters Prema. The right to usufruct of land and ownership of the building was then transferred to the company of Prema SA, and then to Prema Invest SA. Provincial Administrative Court in Warsaw has stated so that it was not possible to take into account the proposal of decree aplication because of a prior commitment by a notarial act right of usufruct to another party. The Printshop and Bookstore św. Wojciech appealed against this judgment to the Supreme Administrative Court. Supreme Administrative Court considered judgment of the Provincial Administrative Court to comply with the law and ruled that, in the event of conflict of interests of the former property owner and user perpetual Administration cannot solve the notary contract of usufruct; can only do in the Court of session. Even so, after the fulfilment of all conditions. 7.2 existing decree entitled usufruct of land constitutes a legal obstacle to admitting the proposal of decree aplication. We are pleased to inform that our law firm was included in the „The Book of Lists 2013” published by the Warsaw Business Journal. „The Book of Lists” is a ranking of the best companies providing legal, consulting, banking and other services. On 27th of February 2013 Zuzanna Łaganowska was an expert on SOLAR+ FORUM 2013 THE FUTURE OF PHOTOVOLTAICS IN POLAND during ENEX trade fair in Kielce. Solar+ Conference is a unique meeting of designers, systems contractors, investors and photovoltaic systems distributors. The conference topics related to technological, economic and legal issues. Zuzanna Łaganowska once again was the legal expert during the annual fair of ENEX in Kielce. She appeared during the forum Agro Investor OZE organized by the GLOBENERGIA publishing house. It was a Conference to present the possibilities of the use of renewable energy sources in the farms. Attorney at law Igor Bąkowski appeared in Polsat News as a legal expert in real estate law. 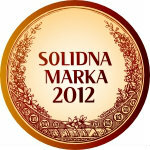 We are pleased to inform that Bakowski Law Firm was awarded the prestigious title “Reliable Brand 2012”. The “Reliable Brand” programme is carried out under the honorary patronage of the Minister of Economy, and its aim is to promote and to honour reliable firms focused on corporate social responsibility and quality of products and services. The “Reliable Brand” title should be an information for the client that the honoured firm ensures high quality of products and services. 8 marca 2012r. Radca Prawny Igor Bąkowski był prelegentem na Forum Energii Wiatru podczas targów ENEX w Kielcach. We have the pleasure of informing you that in march this year Bakowski Law Office was named Real Estate Law Firm of the Year in Poland. These prestigious title was awarded by Corporate International Magazine based on the firm’s most highlighted transactions in 2010. Igor Bąkowski prowadził seminarium p.t. „Planowanie i zagospodarowanie przestrzenne w świetle zmian i nowelizacji Ustawy o planowaniu i zagospodarowaniu przestrzennym ze szczególnym uwzględnieniem problematyki inwestycji infrastrukturalnych i liniowych”. Seminarium było adresowane w szczególności do przedstawicieli spółek energetycznych, gazowych, telekomunikacyjnych i drogowych oraz przedstawicieli organów administracji. Radca prawny Igor Bąkowski ponownie gościł w programie „Ostatnia Instancja” w charakterze eksperta dziedziny prawa nieruchomości. Wypowiadał się na temat prawnych aspektów budowy elektrowni wiatrowych. Radca prawny Igor Bąkowski wystąpił w programie telewizyjnym „Ostatnia Instancja” nadawanym przez kanał POLSAT NEWS jako ekspert z dziedziny prawa nieruchomości. Tematem programu były ograniczenia w użytkowaniu nieruchomości związane z ochroną środowiska.